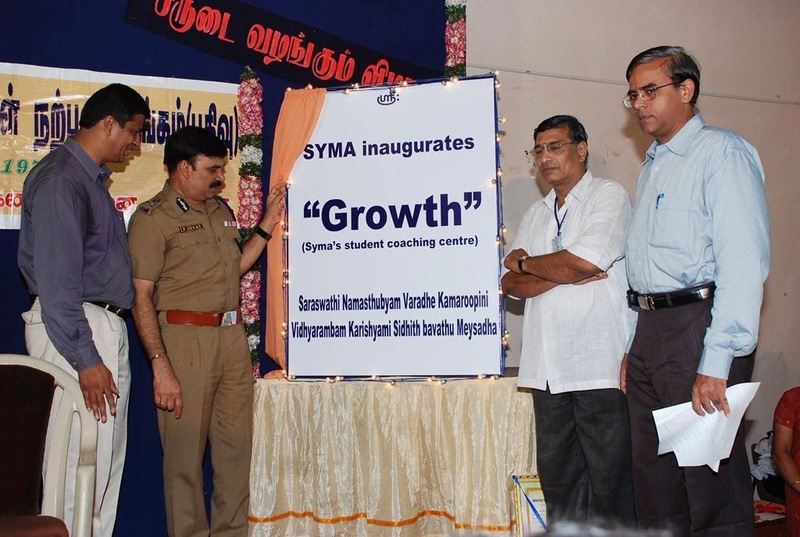 "Sampath Speaking" - the thoughts of an Insurer from Thiruvallikkeni: SYMA Growth - X Standard students perform very well..
SYMA Growth - X Standard students perform very well..
A file photo that makes us proud ...... Six years ago, on 6th July 2008, on a very auspicious day – SYMA Growth was born. It was inaugurated at NKT National Girls Higher Secondary School, Triplicane by Shri R Sekar, IPS, (the then) Commissioner of Police, Greater Chennai. From that day onwards, lots of SYMA volunteers have strained themselves to ensure success of the project. Today, the results of X Standard State Board results have been announced and we are basking in happiness. The exams were conducted in the month of March. In the State, the overall pass percentage of 2013 had reached 88.1 percent, where the girls scored more than boys, wherein 38, 000 students obtained cent percent marks in Science, 29, 000 students obtained full marks in mathematics and 19, 000 in social science. Durga Devi G of TVS Matriculation Higher Secondary School in Madurai, Hema Varsini G of Velammal Matriculation Higher Secondary School near Chennai, and Vijayamoorthy S V of G R G Matriculation Higher Secondary School in Peelamedu, Coimbatore, shared the first rank by securing 500 out of 500 in the exams. SYMA [Srinivas Youngmen’s Association] has been in the field of Social service since 1977 ~ in the past few years, our initiative in the field of Education ‘SYMA Growth’ has been prospering. SYMA Growth – a fullfledged tuition centre, is our cherished initiative in educating the economically poor children, uplifting their standards and making them responsible citizens. We live by the axiom that ‘Education is the only tool which can uplift the Society and empower the lower echelons of the Society’. The foremost responsibility of a Social Service Organisation is to improve the society and help the underprivileged. At SYMA Growth, we have X Std Tamil Medium; X Std English Medium; +2 Commerce Group and +2 Science Group. There are anxious moments in life ~ the day when results are announced is one of that. In the recently published tate Board +2 results - 5 of our students secured more than 1100/1200 in Commerce Group – and 1 in Science group has got more than 1100. Our topper TP Rangan has got 1164 [200 in Accountancy & 199 in Economics].